If there are stains or buildup on your sinks and bathtubs…if you have to use large amounts of soap to clean dishes or wash your hair…or if your water tastes or smells odd, you probably have hard water and need to use water softeners. West Coast Plumbing & Water Treatment Products – Professional Series Water Softeners eliminate the effects of hard water by removing the calcium and magnesium found there. Water is treated at the point-of-entry to the home, extending the useful life of water heaters, coffeemakers, humidifiers and household plumbing by as much as 30%. Hard Water passes through the media tank that contains resin beads coated with sodium ions. The calcium and magnesium ions are exchanged for sodium (or potassium) ions, thus softening the water. When the beads have trapped the hardness and need to be regenerated, the ENVY™ Water Softener Series control valve charges them with the brine from the brine tank. Capacity is one of the first things you should look for in a water softener. The average family uses 80-100 gallons of water per person per day. That means a household of five requires 400 gallons of softened water daily. If your water had a hardness rating of 30 grains per gallon (grp), for example, you would need to remove 12,000 grains per day (400 gallons x 30 grains). 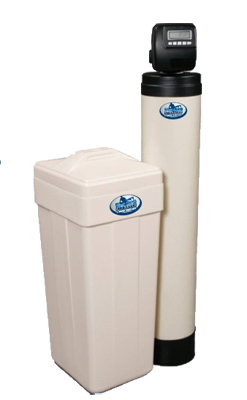 With a water softener regenerating every 3 days, your minimum softener capacity would be 36,000 grains (12,000 per day). Up to six fully adjustable cycles tailoring your ENVY™ Series Softener System to your home and families water use needs. Flow rates to 27 gpm, ideal for nearly every size home and family. Operating pressure to 125 psi and operating temperatures to 110 degrees Fahrenheit ensure a rugged, reliable system. Computer initiated regeneration to reduce salt and water usage during system regeneration. If there are stains or buildup on your sinks and bathtubs…if you have to use large amounts of soap to clean dishes or wash your hair…or if your water tastes or smells odd, you probably have hard water. If left untreated, the minerals in hard water will cause yellow stains on plumbing fixtures and be deposited as scale, eventually clogging plumbing and shortening the life of appliances like washing machines, water heaters and dishwashers. Scale deposits not only cut down on the efficiency of these appliances, they cost you money, increasing both energy and maintenance bills. Up to six fully adjustable cycles tailoring your charger system to your home and families water use needs. Operating pressure to 125 psi and operating temperatures to 110ºF ensure a rugged, reliable system.